Hello! The name is Erika J. Simpson, and I have the outline of the Tardis on my left inner ankle. I got it done at Infamous Ink in Chicago and I can’t remember his name at all. But he was awesome. I got to hear the story of how he lost his virginity while I got the tattoo done! I’m obsessed with time travel and Doctor Who so I thought I’d get married to my love this way. People always want some deep thought provoking answer on why this is here, but mostly is because Doctor Who is the sh*t. I wanted to step outside of the realm of getting the blue box tattoo’d on me, so I went with a simple outline of it. Hope you like the simplicity! 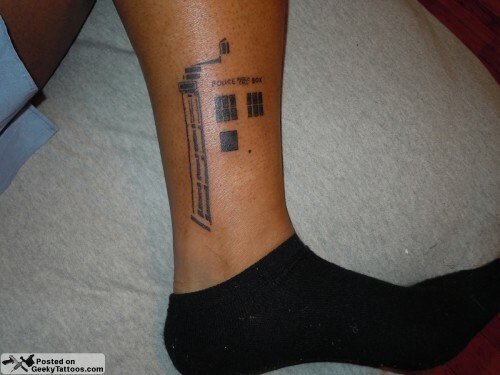 Tagged with ankle, Doctor Who, Infamous Ink, TARDIS. I really like it! It is definitely unique and has given me something to think about!